I have recently discovered an online shop that carries a variety of Eco-friendly clothing, accessories, and home products. 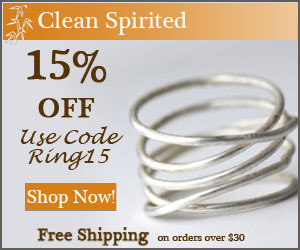 Clean Spirited is one of our new affiliates and they offered to review a couple of items. I received the Britta Ambauen Silver Remember Me Ring for myself and the Anvil Children's Organic Cotton Tee in light blue for Baby T.
One unique thing about the Clean Spirited shop is that they donate $1 of every order to Eco-Charities. They take the guess work out of what's Eco-friendly or not, all the products are hand picked and each listing has a 'Clean Spirited Rating' which is based on five points: natural, recycled, local, fair trade, and humanitarian. The tee that you see above on Baby E may seem like just a basic tee - but it is so incredibly soft, high quality, and made from organic cotton grown without pesticides. It is also locally manufactured to further reduce the carbon footprint. It's the perfect everyday accompaniment to any outfit and it is so comfortable for baby, gentle enough for sensitive skin. The organic cotton tee retails for $18.99. There are also many other options for organic kids clothing. The ring I received fit me perfectly, to my surprise - it's hard to size a ring when you are buying online. I love the simple knot design and that it goes with everything. It is designed by Britta Ambauen and made to the highest standards - a natural material, locally made, and fair trade. This designer has a variety of unique Eco-friendly jewelry for sale at Clean Spirited. This particular sterling silver ring costs $38 and is available in sizes 5 through 9. Like those rings a lot!